Providing children with a safe and nurturing educational experience. Read below for details about the After School and Camp Programs including applications and payment options. Early childhood education programs are vital for community viability and productivity. They play a critical role in a child’s development and school readiness and are a necessity for many working families. Licensed under Bright from the Start, our Early Learning Academy (ELA) is committed to providing working families with quality, affordable childcare and early education for children ages six weeks through five years from 7:00 AM to 6:30 PM daily. 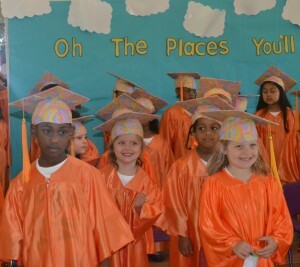 Students receive cognitive, social, and emotional development in a nurturing environment and, upon graduating, are fully prepared for kindergarten and future academic success. We currently have spaces available in our preschool classrooms. 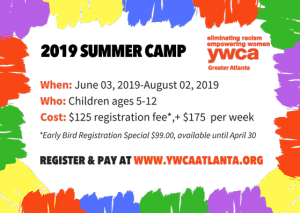 Register today for the YWCA of Greater Atlanta’s 2018 – 2019 After School Program! We provide transportation from Morningside Elementary School and Springdale Elementary School and a safe and nurturing environment with homework assistance, nutritious snacks, arts and crafts and physical activities. Care is available from the first day of school on August 1, 2018 for children attending kindergarten through fifth grade. 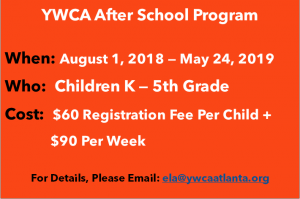 Download the After School Program application and pay the registration fee below.